Cate: Please welcome Yolanda Sfetsos to my special Halloween celebration. Yolanda, please tell us a little bit about yourself. Yolanda: Hi Cate! And thanks for having me here today. Well, I’m a writer who lives in Sydney, Australia. I’ve been writing since my teens and enjoy the process a little bit more every day. I just love telling stories. Usually stories that have a little edge of darkness, no matter what genre—because I love to write in a variety of genres, and even blend them together. When I’m not writing, I love to spend time with my husband and daughter. We go for walks together, watch TV shows and movies, play Rock Band, and just hang out. I also LOVE to read and collect books. Yolanda: Living in Australia has dimmed the Halloween experience a bit because we don’t really celebrate it all that much. Sure, nowadays there are a lot of Halloween-related goodies available from the store and some kids even try trick-or-treating, but it’s not the same. Still, I’ve always been fascinated by it. When I was a teenager, I’d make sure that on Halloween, I spent hours watching a horror-movie marathon. I’ve always loved Halloween-themed movies and books! Do you have a favorite memory of a Halloween past? Yolanda: I would probably have to say the first Halloween that we celebrated with our daughter, when she was about five or six. I’d always told her about it, so when October 31 came around she wanted to decorate the house a bit, and even dressed up. We also watched some scary (children’s) movies. It was fun to include my daughter in something I’d always liked. Yolanda: Yes, I have, several. And they all took place in a creepy house that I lived in when I was a kid. Gosh, I think I was about ten or eleven, and every time I went to bed, I’d hear something/someone moving things around outside my window, or above the ceiling. It was really freaky and kept me up a lot at night. But the freakiest thing was sitting in the living room by myself one evening, watching TV, and the blinds opened and shut by themselves. I’m serious, they did. I ran out of the room, but no one ever believed me. They claimed that I had an overactive imagination. A few weeks later, the neighbor’s kids told me that our houses were built over an ancient cemetery. I never believed that, but it made for some sort of explanation. I totally believed that house was haunted! Cate: That would be scary! What frightens you the most? Cate: Yikes, I can imagine. Ever gone on a ghost tour? Or ghost hunting on your own? Yolanda: Oh, gosh, I hate to say it, but I’m not much of a cook. So I don’t really have any recipes of any kind to share. Lol. Although I do think that you can’t go wrong with a medley of candy, chocolate, and chips. Cate: Those are always crowd pleasers. I'll have some recipes later on the blog, so come by and check them out! Yolanda: I’ve got a new release from a new publisher called, Evernight Publishing. My story’s called THE SOUL DEALER: Deception, and it’s a paranormal love story between a man who lost the woman he loved, and the ghost she’s become. It’s actually set in Sydney, during Halloween and I had a great time writing/editing this story. Cate: Intriguing! Care to share a blurb or excerpt? Fate’s cruel hand took Alana from Matt before he had a chance to tell her how he felt. A year later, he’s still mourning her loss but Matt doesn’t realize that he hasn’t completely lost her. Yet, he’ll never know how close she really is if he continues to ignore his ability. Alana has struck a deal that’ll save Matt before the end of All Hallows Eve, but time is running out. And if it does, both of their souls will be lost. And if you’d like to read an excerpt, you can read the prologue right HERE. Yolanda: The inspiration for this story was Halloween. I’d always wanted to set a story during Halloween, so I ended up writing two. 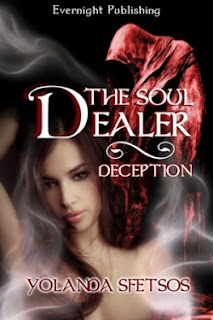 THE SOUL DEALER: Deception is followed by THE SOUL DEALER: Redemption, which will also be available from Evernight Publishing this year. I wanted to write a story about two close friends with separate dark pasts, as well as a multitude of secrets between them. I also wanted to write a heartbreaking love story. What I ended up telling was a story of unfinished love, and second chances, in a world where the supernatural exists and is at its most powerful during this season. Cate: Love the theme of redemption. Anything else you’d like to share? Yolanda: Well, if you’d like to find out more about me and my books, you can visit my website: www.yolandasfetsos.com I also like to hang out at Twitter and blog almost every other day. Oh, and this month I’ve also got another story too. TOUCHING MOONLIGHT is now available from Eternal Press. This one’s a futuristic romance, and you can find out more here. Cate: The same to you, Yolanda! 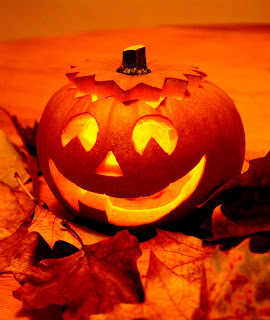 How sad, no Halloween to celebrate in your part of the world. The creepy house you lived in as a child over the burial ground sounds spooky. I wonder if you did any research on it. Love the theme of the novels, and your new one sounds like a winner, too. Thanks so much for having me here today, Cate! :) This interview was a lot of fun. Hi & thanks for dropping in, Lorrie. Y'know, after we moved away, I tried not to think about that house, so I didn't research it at all. :/ Something that I should've done, I guess. Great interview, Cate and Yolanda. Wow, that creepy house you lived in sounds kinda fun. Okay, maybe not as a kid, but to check it out as an adult might be cool. Love the cover for The Soul Dealer, btw. I know, the cover is awesome and was made by Dara England. Your experiences are so interesting and unique! Not only does the book sound great - you have wonderful stories to tell! Thanks for being part of my Halloween celebration Yolanda!